For most people the word “keychain” conjures up the image of a gnarled, tangled ring, whose keys are inexorably bound to a nail-splitting spiral that never produces the right key at the right time. Not the best setup for something we all use everyday. The Keyport Slide plans on changing that. Smaller than a box of Tic-Tacs, the device has 6 slots between the front and back that hold interchangeable “key blades”. The key blades slide out at a moments notice via color-coded nodes, meaning you always have just the right key when you need it. While the Keyport is both lighter and quieter compared to its age-old counterpart, it’s also far more comfortable; gone are the days of bulging keys stabbing you in your pocket (and scratching your phone in the process). 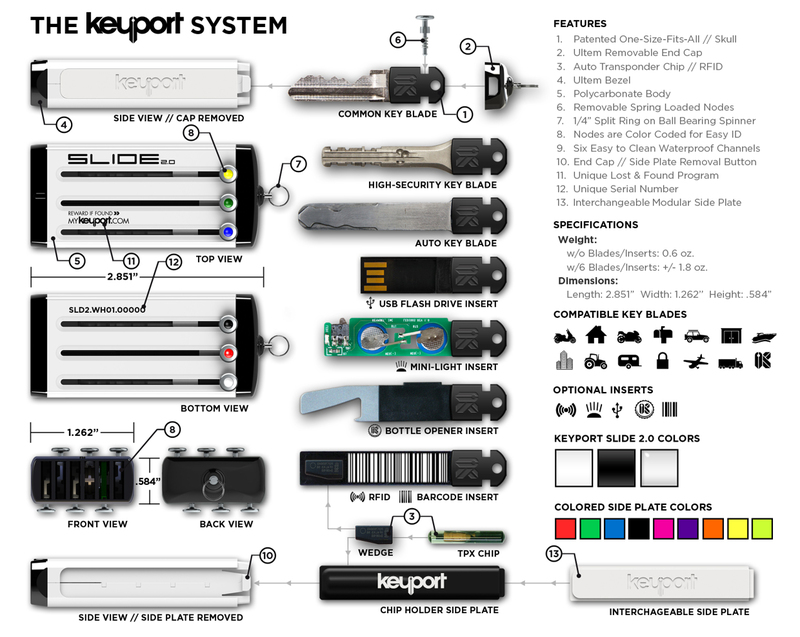 Along with keys, the Keyport Slide can also be fitted with Swiss Army Knife-like inserts, ranging from things like flashlights and bottle openers, to flash drives and RFID tags. Outfitting your Keyport Slide with your keys involves sending a picture of your key to Keyport, who then sends you the appropriately sized blade. Duplicating your key to the blade can be done at a Keyport authorized dealer, or other locksmith.